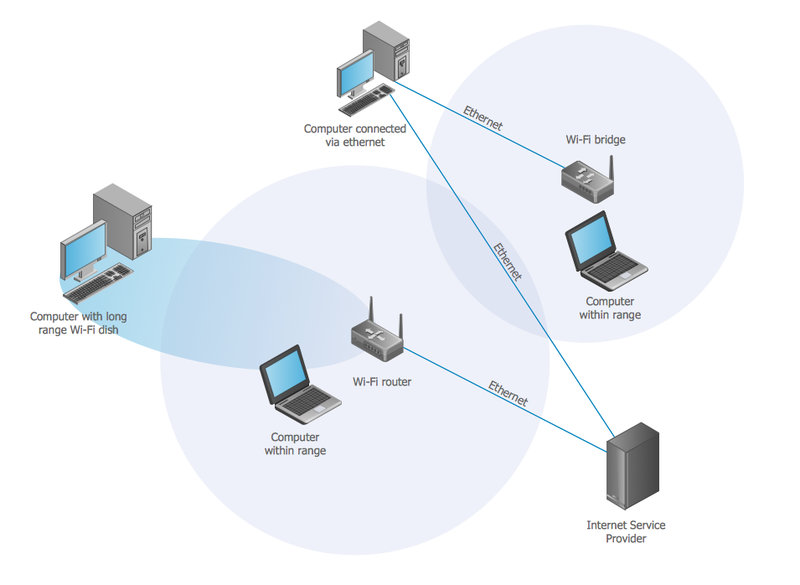 A Wireless network is a type of the computer network that uses the wireless connections for connecting network nodes for data transfer. The wireless networks are very useful, inexpensive, popular and widely used. They are easy setup and do not require the cables installation. The wireless networks are usually realized and administered using the radio communications. The examples of the wireless networks are Wi-Fi local networks, cell phone networks, communications satellites, terrestrial microwave networks, and many others. This example was created in ConceptDraw DIAGRAM using the Computer and Networks Area of ConceptDraw Solution Park. It shows the WI-FI network that includes the Wi-Fi router, wireless devices, computers equipped with the wireless adapters. Computers can easy connect to the Wi-Fi router (access point) and access the Internet. Using the solutions of the Computer and Networks Area for ConceptDraw DIAGRAM you can design the wireless network diagrams of any complexity quick and easy.